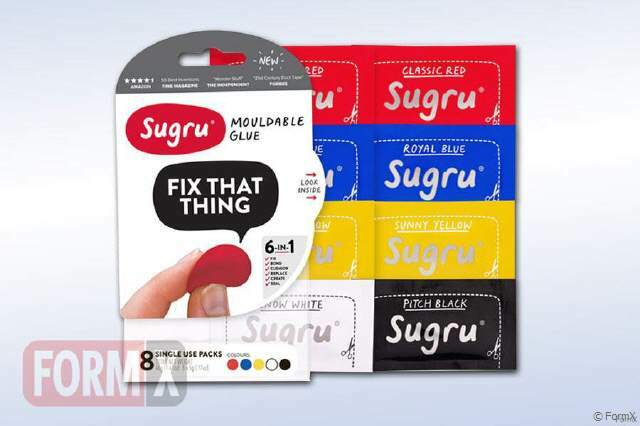 Sugru is the world’s first mouldable glue that turns into rubber. It all started with an idea and a small team of product designers and material scientists here in London. Our dream is to make fixing, modifying and making things easy and fun for anyone, and Sugru is our solution. This patented silicone technology is unique. Out of the pack, Sugru feels like play-dough, and it's that easy to use too. It bonds to almost any other material and cures just by exposing it to air. Its durable cured properties mean it'll stay strong and securely bonded anywhere from the freezer to a steamy hot shower, from the home to the great outdoors. 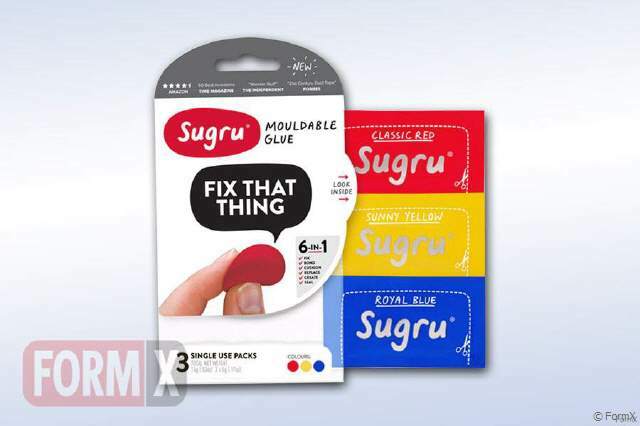 3 5 g single-use packs of Sugru in Classic Red, Sunny Yellow and Royal Blue ready for you to do 3 awesome projects or fixes. The Classic colours pack is perfect if, like a good Scout, you want to always be prepared. With this combination in your jacket pocket, you can blend them together to get a whole spectrum of in-between shades. You never know what need might arise... also great if you simply love the primaries. 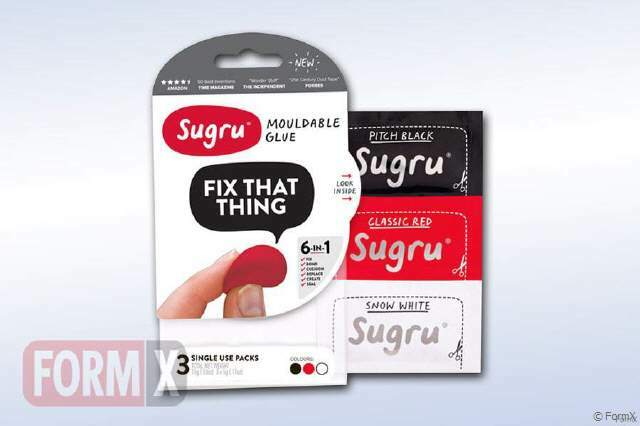 3 5g single-use packs of Sugru in Pitch Black, Snow White and Classic Red, ready for you to do 3 awesome projects or fixes. This pack is the perfect choice if you want to try Sugru in a range of projects from fixing kitchen appliances to protecting cables. With this pack in your pocket you are prepared to fix almost anything. 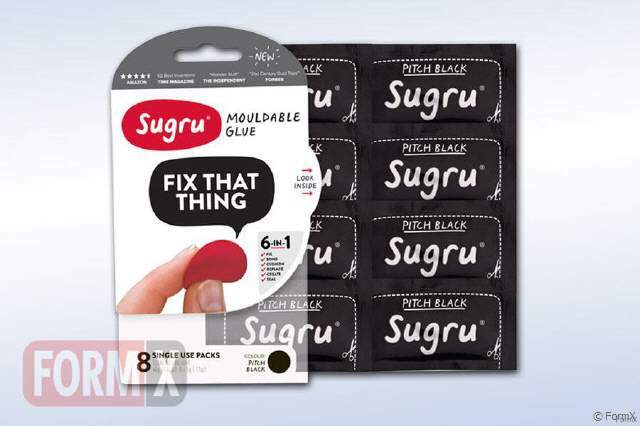 3 5g single-use packs of Sugru in Pitch Black, ready for you to do 3 awesome projects or fixes. Pitch Black is the perfect colour choice if you're Johnny Cash, or if black is simply your favourite colour. It's also great if your next project involves black gadgets, shoes or the inside of your car, or anything that's black really. 3 5g single-use packs of Sugru in Snow White, ready for you to do 3 awesome projects or fixes. Snow White is the perfect colour choice if you're a big Apple fan, or if white is simply your favourite colour. It's also a great choice if you're thinking of making some little improvements to the kitchen or bathroom, where you'd like it to blend in with your lovely white surfaces. 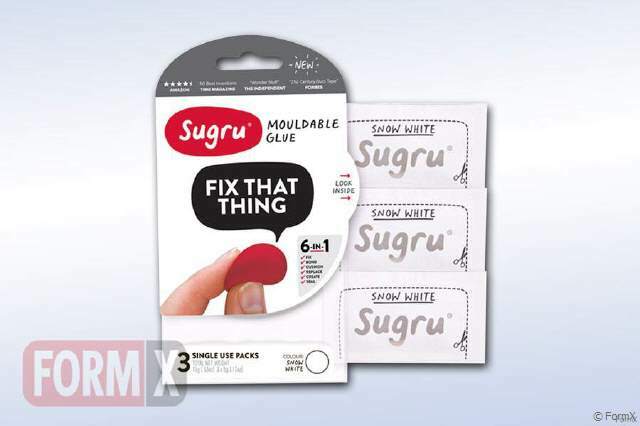 8 5g single-use packs of Sugru in Snow White, ready for you to do 8 awesome projects or fixes. Snow White is the perfect colour choice if you're a big Apple fan, or if white is simply your favourite colour. It's also a great choice if you're thinking of making some little improvements to the kitchen or bathroom, where you'd like it to blend in with your lovely white surfaces. 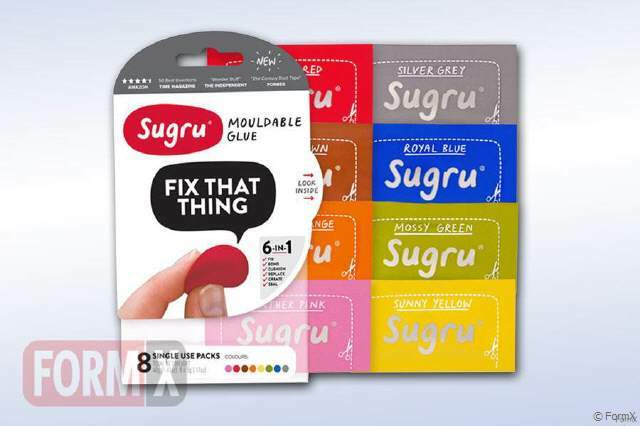 8 5g single-use packs of Sugru ready for you to do 8 awesome projects or fixes. The New Colours pack is perfect for you if these gorgeous new shades are giving you ideas! Also great if you've already got quite a lot of classic Sugru colours used around the house, and for having around just in case... you never know when a need might strike. 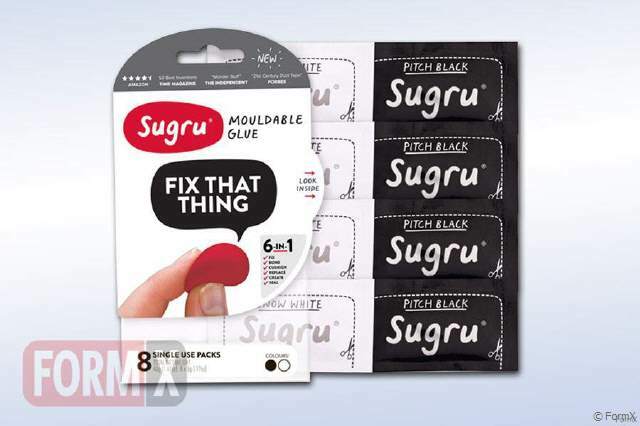 8 5g single-use packs of Sugru in Pitch Black, ready for you to do 8 awesome projects or fixes. Pitch Black is the perfect colour choice if your next project involves black gadgets, shoes or the inside of your car, or anything that's black really. It's also a great choice if you're Johnny Cash, or if black is simply your favourite colour. 8 5g single-use packs of Sugru - 4 Pitch Black and 4 Snow White - ready for you to do 8 awesome projects or fixes. If you like to keep things bold and classic, this is the pack for you. You can't go wrong with black and white, right? It's also great if your next project involves black gadgets or shoes and if you're thinking of making some little improvements to the kitchen or bathroom, where you'd like it to blend in with your lovely white surfaces. 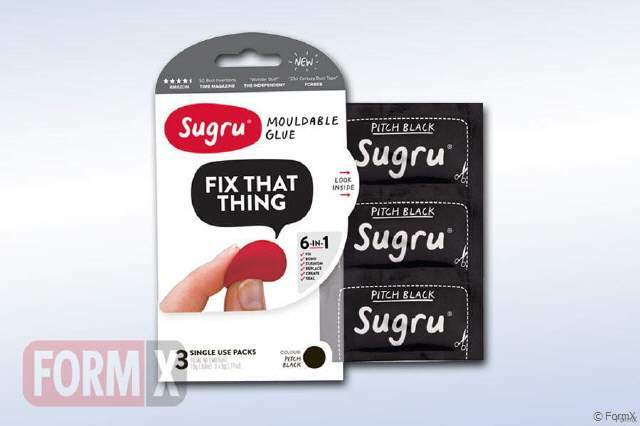 8 5g single-use packs of Sugru in Black, White, Red, Yellow and Blue, ready for you to do 8 awesome projects or fixes. The Classic colours pack is perfect if, like a good Scout, you want to always be prepared. With this combination in your jacket pocket, you can blend them together to get a whole spectrum of in-between shades. You never know what need might arise... also great if you simply love the primaries.